Born Yesterday (1950) – Film Review. Oscar winner comes to Bluray. 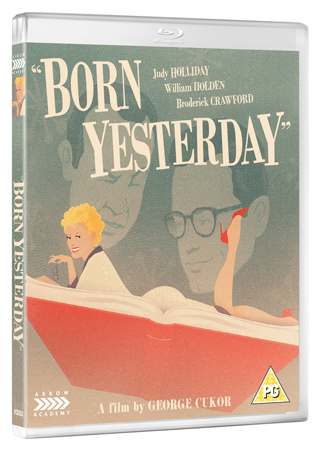 In 1993, Melanie Griffiths, her then husband Don Johnson and John Goodman co-starred in Born Yesterday, a hapless remake of a 1950 comedy classic. It turned out to be an embarrassment for all concerned, with Griffiths nominated for the Worst Actress Golden Raspberry Award, losing out to Madonna’s performance in Body of Evidence. Thankfully, nobody has any thoughts of re-releasing that disaster. Instead, the original film has been dusted down, restored for blu-ray and is now heading our way – and it’s as wonderful as the remake is bad. 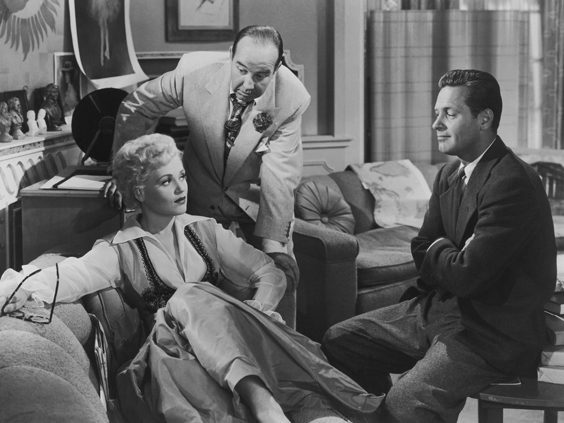 Taking the lead role is Judy Holliday, a then virtually unknown actress, who won the Best Actor Oscar for her performance as Billie Dawn, the uneducated and seemingly dumb blonde showgirl-turned-fiancee of uncouth crooked businessman Harry Brock – no mean feat when you consider she was nominated in the same category as Bette Davis and Gloria Swanson in All About Eve and Sunset Boulevard respectively. Brock wants Billie to be able to converse with the great and good of Washington DC (they’re in the city so he can ‘buy’ the congressman he hopes can further his dodgy business interests), so hires journalist Paul Verrall as her coach. Billie turns out to be a far better student than anybody ever imagined. As a result she begins to realise just how unlawful Brock is – and falls in love with Paul in the process, leading to a wonderfully happy ending. In between are some sharp one-liners from the pen of Garson Kanin, who wrote the far racier stage version (the film’s producers had to make several changes to get the script past 1950’s censors), and is perhaps best known for co-writing two of Katharine Hepburn and Spencer Tracy’s sparkiest comedies – Adam’s Rib and Pat and Mike – with his actress wife Ruth Gordon. Holliday sparkles as Billie, leaving her leading men, Broderick Crawford as the bullying Brock and William Holden as nerdy Paul, trailing in her wake; it’s a tragedy she died at the age of 43, leaving us with only a handful of films. The disc also includes newly filmed appreciations of the film, as well as a profile of Holliday. They’re fascinating, but even if it only contained the movie itself, Born Yesterday would be well worth owning – just make sure you never watch the remake.